Thanks a lot guys, post your ideas below, or in one of the discussion/brainstorming threads if there are things you feel should be on the lists! You can also make individual comments on each Feature Request, or Bug Report listed in the Case Tracker. Nice! This is what i was expecting, i'll stay tuned to any update. - If added, Aircraft carriers would need the support of other ships, not only boats. So consider adding a frigate in case you add the carrier too. These only would receive orders by the high commander, not controllable by players. Same applied to the aircraft carrier, although players could control the weapons and turrets of this one if necesary. - Although you said you did not want a hovercraft I still would recommend some kind of ship/boat capable of transporting some vehicles. It would be perfect for an amphibious assault aircraft carrier. (So this feature goes together and along with the aircraft carrier feature). - Airplanes: jet powered air units for fast attacks on enemy positions. I would recommend having VTOL ones. (Battlefield 2142 and ET: Quake wars as reference). _ Exosuits/exoskeletons? (End of nations walkers reference). - Different types of alien life for each different environment. - Environmental disasters, but these wouldnt be randomly created (Or yes if you find a way to make this work, considering custom maps too), the commander would. Have you ever heard of weather/environmental warfare? For example creating a tornado to destroy enemy forces. There could be some machine/special command point in the map, that if captured, you could use it to create a disaster somewhere. ( Black and white 2, the earthquake, volcano and tornado as reference) you would have to spend resources and wait some time to be able to use it. enemy team can stop that from happening so it must be protected. - Map editor easy to use and as complete as posible. (Far cry 3 and Halo forge reference). - User friendly at modding and adding new features content, that means that if someone wants, he could do a spaceship gamemode, or antyhing he can imagine related to this game. (Arma series as reference). - Epic battlefields with many air/sea/ground units in screen (Supreme commander and Planetside 2 reference). Yup, I've already got AI/Controllable boats/ships 100% implemented into my game & engine, right now I'm using a Zodiac boat. But I've implemented a full-size Destroyer before :-) That's why it's not on the list. Here is an image [ unshaded, etc. ] 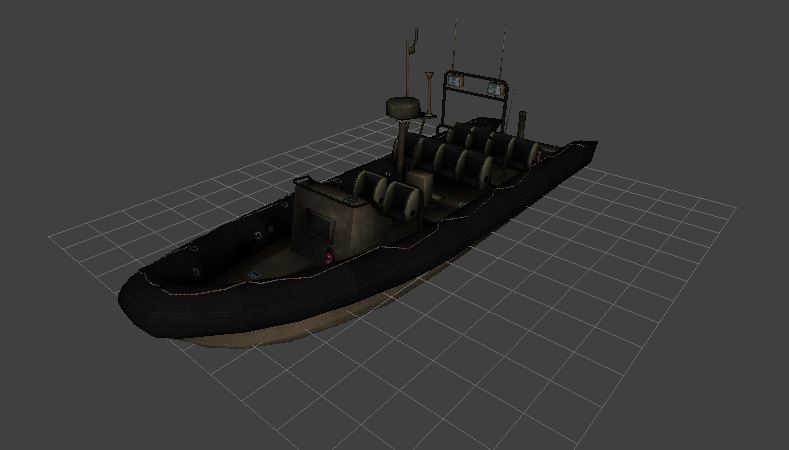 of the Zodiac boat I'm using to test the water physics, etc. Giant ships you can walk & land vehicles on, like Aircraft Carriers, are a whole different beast heh. You can only just collide and interact with the other ships/boats, not walk on them or inside them as I plan for the Aircraft Carrier. Thanks again for all your help in the epic brainstorming thread - http://www.radioactivesoftware.com/content/brainstorming ! I've started a thread in steam greenlight requesting suggestions/ideas/feedback/advises etc... also i have given a link to this thread too. just telling you because some people could post their stuff there and you wouldn't know it. I suppose youve seen ive edited the first post summarizing many different infos and ideas. Maybe google documents has something like that, or a bug tracking software? you could ever use it after releasing the game for bugs and other game issues people may have. Hmm, it gave me an error, probably have to be logged in. Though I'm sure that's exactly what I'm referring to, it's essential to managing even the suggestions you've given. I'll get that implemented ASAP, it will be a great help especially for bug tracking etc. I'm pretty sure it would give you new ideas for the game, and would motivate you at doing something for your game. I hope you understand what i'm trying to say. Yup :-) I've been a huge fan of their stuff since Operation Flashpoint :-) I'll pick it up for sure. FYI I found a feedback/bug/feature tracking system for the forum/website, I will be integrating it tomorrow. Also have made tons of progress on the game today! Cool, that should make thing easier and better and more organised. I cant wait to see the new updates! I saw you added a drpship that lifts vehicles, but it seems that its the same as the infantry one. Do you think you could make a variant of it specially designed to only transport/lift vehicles? Mix between v-osprey, helicopter crane and halo pelican? (vehicle is attached to the hull). Yea I was just going to add the lift capability to the current dropship, I have to reuse resources wherever possible. The game is already a 5GB download and I have over 4,000 files that ship with the game in the current pre-alpha stage. The texture data alone for the current dropship is about 300MB+, I have 4096x4096 textures ( color, normal, specular maps ) plus 3 color skins ( desert, arctic, grassland ) to do this for another model with a slight functional difference wouldn't be practical. Plus I'm self funding all the artwork creation. If you guys wanna give me a million bucks on kick starter, sure I'll get you 20 dropship types created lol, until then I have to be very practical about the assets I choose to have produced at this stage. wow, this really changes things. Then maybe youre right, you should use the same vehicle. But it is there any way where you can simply delete the cargo section that is loaded by infantry, so you can place a lifted vehicle there? Using the same model and textures and all (so those 300 MB textures are used on this 2 models, or maybe you could simply find a way to separate the cargo load section of infantry, and have the cargo load section of infantry as another model that is joined together to it in some way.) This way you would reuse resources, save time, and the game would still be 5GB. But of course this sounds a bit complicated to do, it depends of how you have done and organised the model. You could try this if you get enough funding if it seems to difficult to do without them. Yes, this is exactly what I was going to do :-) I do it all the time in the game currently, disappearing magazines from the guns for instance - or the AT4 rocket being attached and launched from the AT4. So it's just a matter of attaching a the lifting mechanism to the bottom of my current dropship, it costs me a Draw() call, though. That's pretty trivial. EDIT: I kind of like the physics based hook idea in the chinook image! lol ... sort of a meta-game, trying to hook up the vehicles lol. Ok fine, looks like specifying it, was a good choice i made, now i understand it better. Mm, yes its cool, but if the string and hook are too large that could cause some problems, because aircrafts would have to fly very high to avoid colloding, plus it would be imposible to land without unlifting the vehicle. That's why i said something that is attached very close, because you even can lift vehicles while the dropships are landed without cargo them inside the hull. The only thing you should consider if you add a version with and without the cargo for infantry, are the wheels, because if you delete part of the hull the rear wheels wont have a support. different wheels design shouldnt be a problema though, make them specified for the lifter only. (I don't know if there could be another solution to this). This is really well done! include it in the next news you make (You said you had done more stuff for the game, right? when you have something else that allows you to make a proper news/update, make an update in moddb, greenlight, etc...). Why is the information in latin lenguage? EDIT2: Posted a comment and a ticket. Hope it works correctly. Yup will do - would you mind adding some stuff to it right now so I can start testing it before it goes live ? Now we have to get all this stuff into the case tracker ugh :-D Let me know if you have any feedback on it, I can change pretty much anything. Posted a comment and a ticket. Hope it works correctly. I also updated the summary list of features. This is just too awesome to be true, even Battlefield 4 destruction doesn't stand a chance against this destruction lol. I have a question... Do the vehicles spawn/respawn automatiicly in the bases/command points/etc? (Like in FPS such as battlefield) Or do you have to recruit them? (Like in RTS?) Just because I remembered that: http://www.youtube.com/watch?v=y0rDb73KxWs has a control panel/console that puts you inside a vehicle you choose, kinda similar to Planetside 2. And it is used by the IA. They can't delete them, just mark them all as resolved... once I fix that, and finish typing up the instruction page ( http://www.radioactivesoftware.com/content/killing-horizon-project ) this should be good to go! It can't be true :-) In order for physics like that to affect multilayer gameplay ( your controlled player/vehicle ) they have to be synchronized across all the game clients, for visual and physics simulation purposes. That will not be happening aaaany time soon :-) sorry hehe.